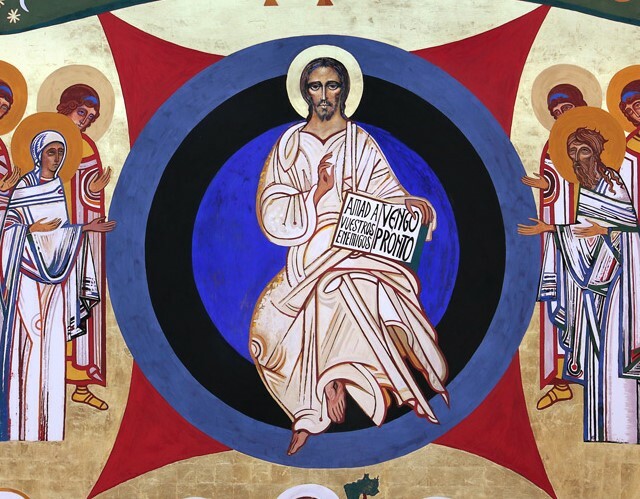 There is a specific depiction of Christ known as Christ Pantocrator. It was widespread in the ancient world and still is today. The title "Pantocrator" is most often translated into English as "The Almighty One" or "The Omnipotent One." It comes from the Greek words ?????? (pantos, meaning all) and ?????? (kratos, meaning strength, might, or power). Among the more interesting and provocative juxtapositions of texts is the one commonly used in the Neocatechumenal communities (see above right). On the left-hand page of the open book is the Scripture passage in which Jesus says, "Love your enemies" (Matt 5:44), and on the right is the one in which Jesus says, "I am coming soon" (Rev. 22:7). Provocative indeed, and a sober call repentance! It is hard to see how we could hope to enter Heaven with hatred or vengeful anger for our enemies in our heart. With that eating at our heart it wouldn't be Heaven! Therefore we should consider our final end and beg for the grace to love our enemies by praying for them, working for their conversion, and supplying their basic human needs (cf Rom 12:20; Prov. 25:21). Our goal is to be at one with them in Heaven, and even here in this life if it be possible and rooted in the truth. There's nothing like a passage such as this one to get us on our knees asking for grace and mercy! Indeed, we will surely fail if we seek to love our enemies only through the power of our own flesh or from our fallen nature. Good Jesus, who alone can save me from my hard heart, grant me the grace to love my enemies and pray for those that persecute me. I am weak and too self-centered and thin-skinned to do it on my own. I consent, good and merciful Jesus, to this work of yours in me. Accomplish this, Lord, by your grace!